DETAILS OF THE GOLDEN DOORWAY - The celebrated Golden Doorway of the Transportation Building is partly revealed at the right in our engraving, and the object here is to afford a close study of the lateral treatment, which was alike on both sides. The conventions of ecclesistical architecture are to be seen in the gallery, oratory and organ stairs. Within the door itself we catch a glimpse of one of the most beautiful tympani that have ever been made, and another piece of Sculptor Boyle's art is fastened on the wall beneath the balcony, in the bas-relief. The arabesquerie of the nest of arches is well in view, and the entire scene shows the value of staff for use in these delicate traceries. The roof of the pavilion should be noted, as well as the border of the tympanum over the doorway. In actual views of the doorway these profile stairways did not greatly arrest the eye, so distinct was the splendor of the arches and pylon, and the small panes of the window in the rear lent a sense of the tentative and unfinished to the lateral scene. In the spandrel over the arches a quotation of Bacon was inscribed, and on the companion spandrel (out of view) a similar quotation was made from the writings of Macaulay. 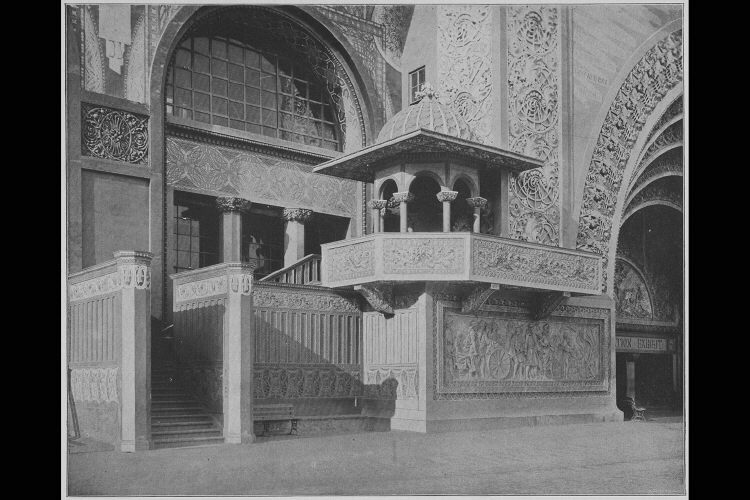 All of the arabesquerie seen in the picture and its extensions were covered several times with gold leaf and silver before it reached the degree of beauty desired by the architects, Adler & Sullivan.